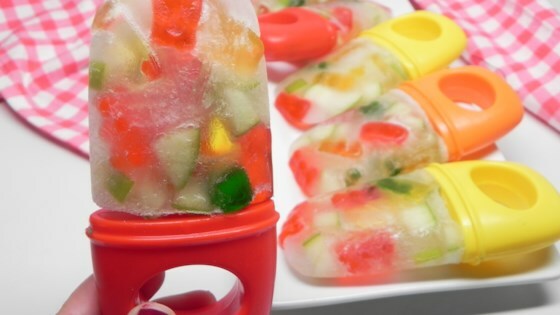 "Want a cold delicious snack for that summer heat? Gummy fruit pops are the way to go!" Combine soda and orange juice in a pitcher. Divide gummy bears and apple evenly between 12 small paper cups. Fill cups with soda mixture; place 1 ice pop stick into each cup. Freeze until solid, 2 1/2 to 3 hours. Any variety of juice can be substituted for the orange juice. Substitute another type of fruit for the apple if desired.